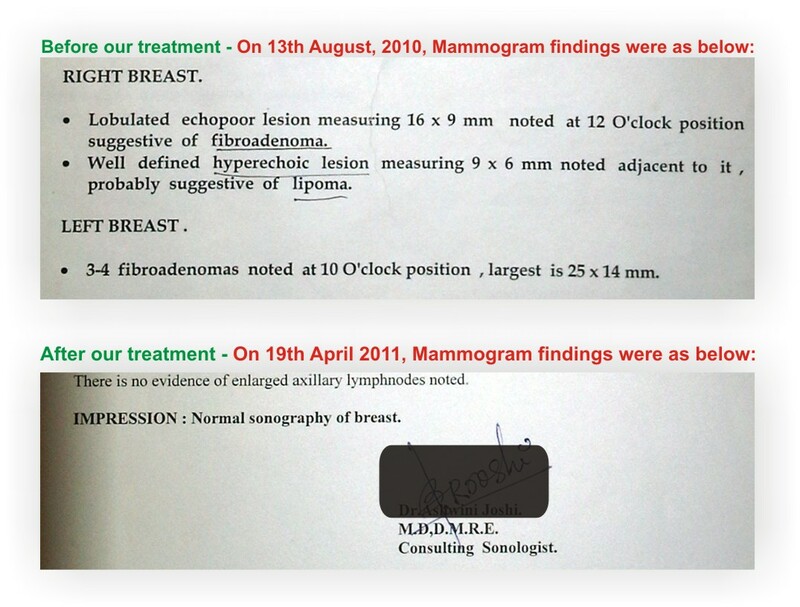 This case is of a 17 year old girl with multiple lumps or fibroadenoma in both her breasts. 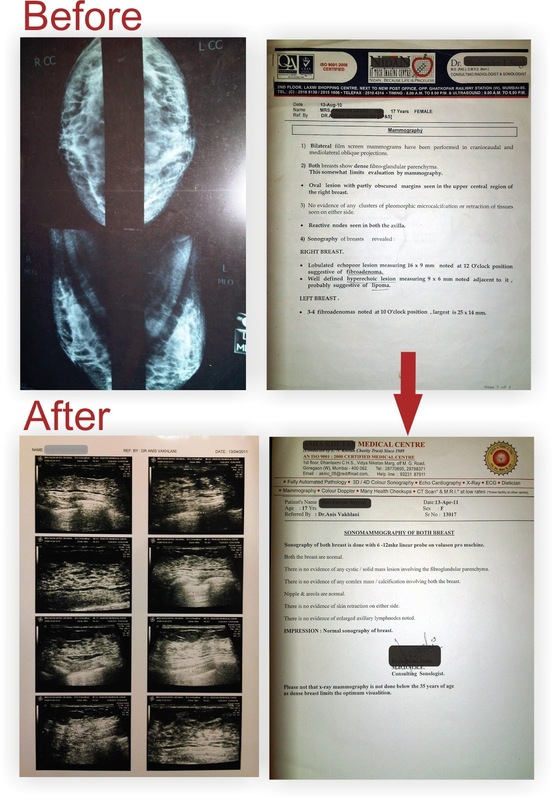 She was operated for one such large tumor following which she visited us as she refused to be operated any further. 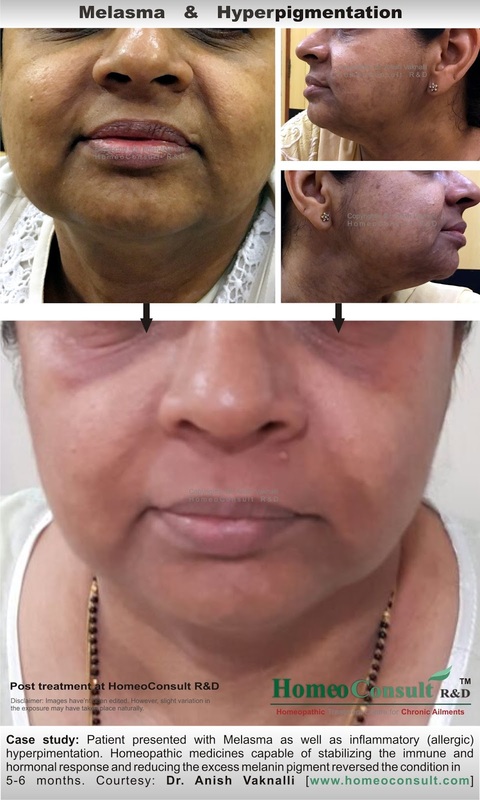 A wise decision as surgery would only be a temporary measure and would scar her permanently. I have known Dr. Anish Vaknalli since 2002. I initially consulted him for irritable bowel syndrome (IBS). I had intermittent constipation followed by running stomach. I had consulted several gastroenterologists by that time; they all advised adding more fiber in the diet. But the changed dietary plan and health exercises didn't have any impact whatsoever on my ailment. Constipation was so acute that bowel movement was excruciatingly painful. I took medication for IBS for two years. Since then I have not experienced this problem. It's easily manageable now. I walked into Dr. Anish's clinic with a crippling condition called IBS (irritable bowel syndrome). This painful disease would cripple me every time my periods came and the spasms were like childbirth, so painful i couldn't walk, was afraid to eat anything, even a little bit of stress would aggravate it. Dr listened intently to me as i explained in detail asking me questions in between about the exact symptoms. Then he gave me the remedies. As i looked at those tiny white sugary pills I kept asking myself is this really gonna work? they taste like sugar, are these placebos? am i really at the right place? so skeptical was I, and then my life started to change. The pain got lesser and lesser with every cycle my bowels started functioning normally, I wasn't afraid of getting my periods anymore which in the past I used to absolutely dread! all thanks to Dr. Anish the magician with his miracle pills. Forever I will be indebted to him for lifting this curse called IBS off me. 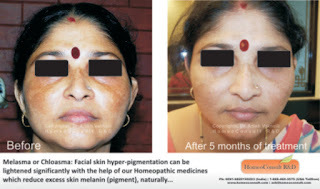 I had been looking for a perfect homoeopathic solution for the last couple years. I tried a few alternatives from India, but nothing seemed to work out well, due to the geographic distance. When I researched my options overseas, I was quite impressed by your email communication option plus your credentials. I immediately decided to take action and am very happy with the continuous progress. It goes without saying that your treatment has been extremely helpful, otherwise I wouldn't have stuck to it after the initial 3 months. Overall I have had no problem with the delivery of medicines either and would definitely recommend them. I have been suffering from repeated episodes of digestion issues for a few years now. While these have not caused me major health issues, they have caused me a lot of bother in terms of impact on daily life (during these episodes). Numerous tests have not indicated any specific problems with any organs and gastroenterologists have indicated that I have borderline IBS which gets triggered off by multiple reasons every now and then. Till very recently my approach has been to take allopathic medicines during those episodes and to try to keep the issues under control. However, these drugs have side-effects which I was worried about. Since the past few months I have been under the care of Dr. Anish Vaknalli and I must say I have seen marked improvement in my digestive system. The frequency of my attacks has reduced quite significantly and the episodes of indigestion have been much milder. I am also quite happy to be able to avoid the tell-tale side-effects of the allopathic medicines which I had been taking earlier. 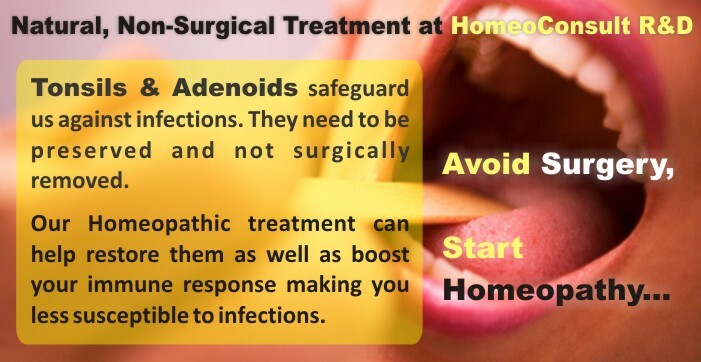 Why get treated at HomeoConsult RD? The most recent approach in treating IBS is addressing the overall symptoms of this disease and prescribing a remedy capable of normalizing unfavorable responses to aggravating factors such as stress, diet, hormones etc. A holistic approach, in our opinion, is the only choice of treatment capable of helping this ailment truly. Thus, unlike conventional IBS treatment, Dr. Anish Vaknalli's homeopathic treatment is a ‘Personalized Approach’. 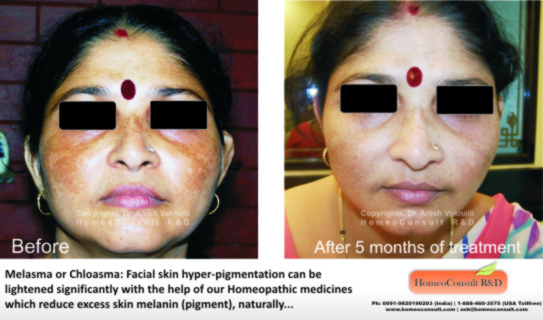 What can one expect from HRD’s Homeopathic Rx? Dr. Anish Vaknalli (MD, HomeoConsult R&D) is an internationally educated & acclaimed Homeopathic physician specializing in the treatment of chronic conditions in children and adults. His researched and proven treatment for skin and hair conditions is 100% natural and safe and used by thousands of patients worldwide. 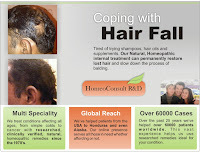 General hair loss, premature balding, alopecia areata, hair thinning and dandruff are some of the condition which can be completely stopped or reversed with this therapy. 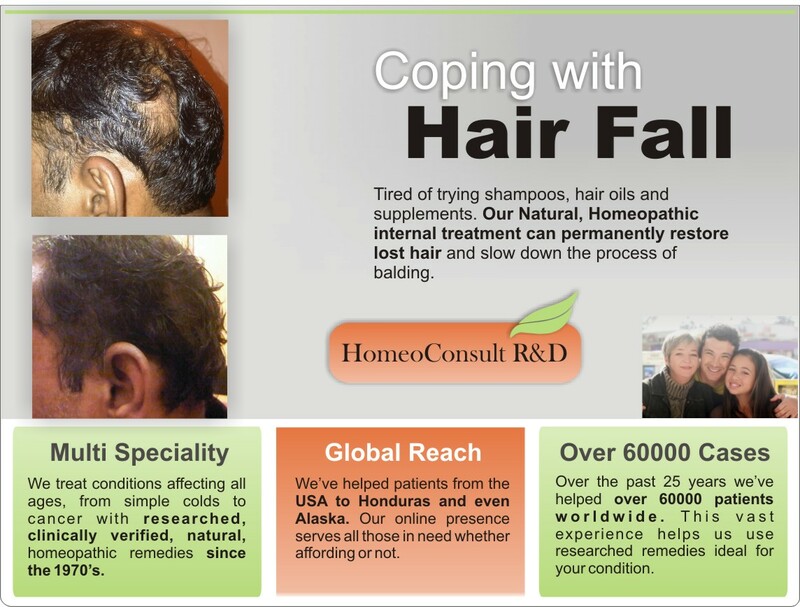 The treatment formulated here consists of an individualistic prescription of internal homeopathic medicines capable of stopping or reversing hair loss due to poor nutrition, hormonal imbalance, stress, auto immune conditions or genetic predisposition. Note: Medicines cannot reverse conditions where complete loss of hair follicles occurs. . We therefore urge you to start this treatment soon before irreversible damage takes place.